Fun red devil slogan bodysuit. Risque red jersey finish with long sleeves and popper gusset fastenings to thong style rear. 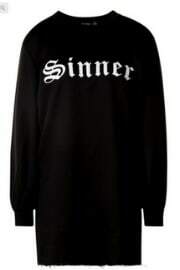 Why not wear all year round with jeans or go bold over fishnets or lacy patterned tights for a Halloween night out. Don't forget to add some horns and heels and a possible cover-up depending on where you are going. Ooh, this one sizzles - brown leopard print design jumpsuit with scooping low back. Add a choker and cat ears or vamp it up with a touch of blood red lipstick smeared down your chin and lengthy nails. 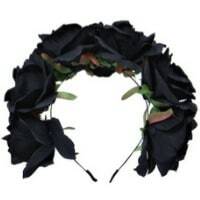 Dramatic but high fashion - wear it if you dare. Happy Halloween. 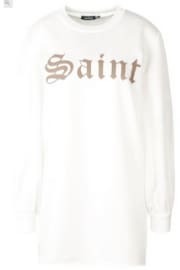 Cute white 'This Is My Halloween Costume' printed T-Shirt. 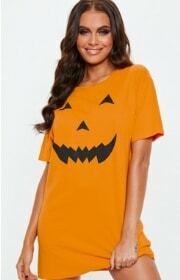 Add to your everyday wardrobe for a fun run up to Halloween a T-Shirts not just for Halloween! Have fun walking around town or wearing at the office keep a bag of sweet treats for all those bold comments that you might anticipate receiving. Then on the night add a few accessories whatever you fancy maybe cat ears, Dracula teeth, witches hat or carry a carved pumpkin. You choose depending on your situation. 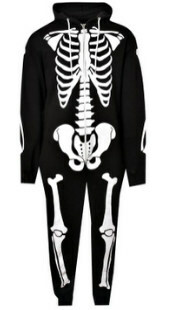 boohoo Man - Need a quick fix outfit for Halloween. 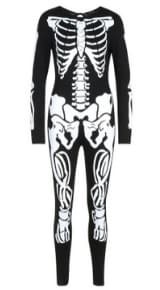 Add a black skeleton onesie show your fun side rather than scaring everyone away. 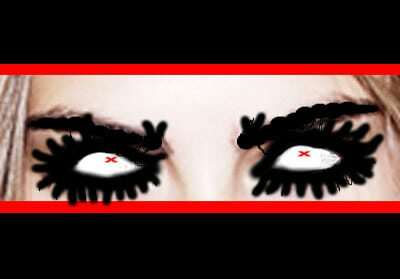 Or add a little makeup for a full-on look. Alternatively rip up an old shirt and let your imagination run wild. Some people like the less scary approach and a comfortable but cute look like this. boohoo Man - Black muscle-fit t-shirt with skull print for a more casual approach wear at any time so why not start the celebrations early. Add more accessories and face paint for later. If you’re looking for decorations then really love the fancy bowls and keepsakes at TK Maxx. We’ve shown Cream Skeleton Wine Bottle Holder. Ten Eye-Ball String Lights. Turquoise Sequin Embellished Masquerade Mask. Black Da Of The Dead Wall Sign. Black Jack-O-Lantern. White Skull Couple Snow Globe. 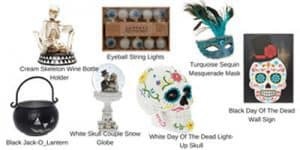 White Day Of The Dead Light-Up Skull. Worth a look before they sell out might just make the table look that little bit special. 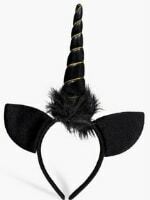 They also have other beautiful masks, fun witches and children’s outfits. See more here via TK Maxx Home Gift Shop. If you’re taking part this Halloween by handing out treats you should place a pumpkin whether real or a plastic pumpkin lantern in a window visible to the street. A clear sign that you will answer the door. So bear that in mind too, if you’re knocking on doors don’t bang on all the doors in the street! Some people are happy to hand out sweets but others disagree with it all. So look for houses that are decorated, showing a pumpkin or sometimes leave a few treats outside. That means help yourself and is also a polite way to say ‘please do not disturb.’ That way you’ll not upset anyone. The Wikipedia link below is interesting so it wasn’t the USA that started it all maybe they were more responsible for the commercialization, which many of us now get to enjoy. Mostly in UK people give out sweets a few will give money. Personally, disagree with dishing out money, it should be for fun enjoying dressing up. Let the children trick or treat with an adult to keep safe, it’s not really for teenagers. As that makes it uncomfortable for others wondering who is banging on their door at night. They are not sure what to give, if they want sweets or expect money. Alternatively, why not have a get together with friends and explore a few traditional games instead with sweet treats and forfeits – such as ‘Bobbing for Apples’ where apples are placed in a large bowl/bucket of water. The apples will float and the idea is to grab an apple with only your mouth/teeth, keep your hands behind your back. It’s a bit disgusting and a bit tricky. So forfeit enough must be winning/getting the apple after everyone’s been attacking it with their teeth! So maybe the prize could be a toffee-apple (that most definitely hasn’t been dunked!) If you get to play – HAVE FUN. If you're planning to celebrate this Halloween get a head start now. Whether it's a children's or adult party you're planning or attending. Get your thinking cap on now. 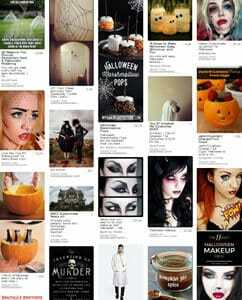 Take inspiration from our Halloween Pinterest board we've added make-up, food and much more. We've included some fun stuff from costume ideas, home decorating, make-up to spooky recipes. For home decorations start gathering DIY items like cardboard, paint, string, bandages or strips of fabric. You can make decorations for next to nothing by using things you would normally recycle. Let your imagination run wild. So, depending on how much space you have to decorate you can decide what to place where. For children make it more on the fun side, you don’t want to give them nightmares. Then for adults don’t forget to make the bathroom spooky you don’t want them staying in there too long. You could store the alcohol bottles in an ice bath and cover in fake cobwebs to deter them from consuming too much. HAVE FUN. Check out our Clothing pages for Men and Women and view the menu for lots more fashion shopping and inspiration online. Women’s Clothing Women’s Footwear and Women’s Accessories. Why not check out Men’s Clothing, Men’s Footwear and Men’s Accessories.